Learn how many plants are needed for a container garden and how to place those plants for maximum effect. One of the more perplexing things for people new to container gardening is how many plants should I include and where should they be placed in the container? The reality is that plants are flexible and there is no "right" answer. There are, however, guidelines that can help you decide how many plants you want to use and where to place them. There are two basic ways to plant a combination. The “living flower arrangement” and the traditional planting. The living flower arrangement is when you place as many plants as possible into each planter. This allows the planter to look full immediately after planting. However, since living flower arrangements are crowded they tend not to have as much longevity and often have greater disease problems than traditional plantings. Living flower arrangements can be really useful if you need to have a high impact container immediately, say for a party the same weekend you are planting the container. Traditional planting is when you allow enough room between plants that the planter looks full after 2 to 3 weeks of additional growth. Generally I would use 3 or maybe 4 plants in 10 or 12-inch planters, 4 to 6 plants in a 14 to 16-inch planter and Six to 8 plants in an 16 to 20-inch planter and so on. With the traditional planting, you need to have a bit of patience to get a completely full planter. However, the plants will be healthier because of better root growth. Less crowded containers also have better air flow around the plants helping foliage dry faster which will decrease disease pressure. While these numbers are a great starting point to figuring out how many plants you need for your container there are some additional things to consider. The number of plants you use can be adjusted up or down by considering the vigor and final size of the plants. For instance, Supertunia® Petunias tend to spread and are quite vigorous, so I would use only 3 plants in even a 14-inch container if I was planting them. They will quickly grow and fill out the entire planter, although, I do sometimes give them a light trim as I'm planting them to encourge even more branching. An even more extreme example would be planting Supertunia® Vista Bubblegum or Supertunia® Vista Silverberry. I have 18 to 20-inch upright containers that I plant every year. I have, on more than one occasion, used one of the Supertunia® Vistas in these large planters. Since these plants are VERY vigorous, I only use 3 plants in even these large planters. Here is an example of Supertunia® Vista Silverberry from my deck in the summer of 2008. The container was planted with the 3 plants in May. The photo on the left was taken July 2nd and the photo on the right was taken September 2nd. Those 3 plants quickly filled the container and it performed like a champ; well into October. On the other hand, plants that are more compact and have an upright nature may take more than the recommended number to make the planter seem full. Pansies are an example of a rather compact, upright, slower-growing plant. Pansies are fantastic for cool season color. However, they tend to be relatively small plants and are primarily grown when the weather is cool which means they grow more slowly. 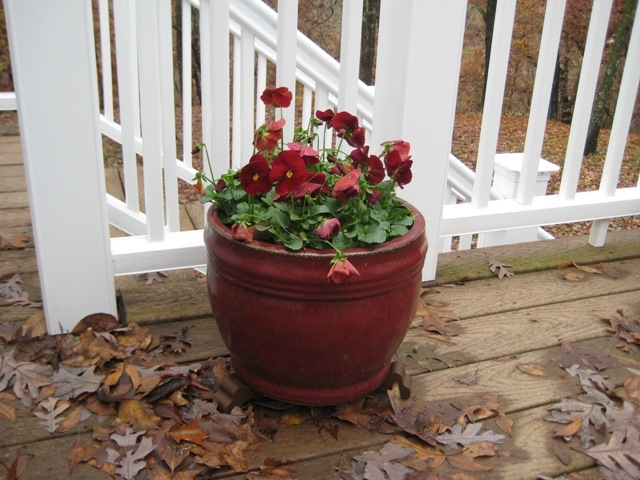 When I plant pansies in pots, I tend to use a lot more than the recommended number of plants I gave above. The photo below was taken at the end of October and the container was planted at the end of September. This is a 12-inch container and it has 8 plants in it. The planter is full without being overly crowded. It had rained for 3 days prior to taking this photo so the plants are looking a bit forlorn. Beyond considering how large a plant will get and how vigorously it grows you also need to consider the size of the plants you are using in your containers. If you are starting from 4 or 6-packs of plants, you will use more plants than if you are starting with 4-inch pots of plants. If you use gallon-sized plants, you will need even fewer plants. For the container recipes on our website, unless otherwise noted, we are using plants in 4-inch pots. The two photos above are planted from different sizes. The Supertunia® Vista Silverberry is three 4-inch plants in an 18 to 20-inch planter. The pansies are eight 6-pack sized plants in a 12-inch planter. More than likely you will be using mostly 4-inch or plants in packs for your containers. Often spacing is included on plant tags. This spacing refers to the preferred spacing for in-ground plantings. However, you can use this spacing information as one way of estimating final size and vigor. Plants that have a smaller spacing recommendation are generally going to be smaller and less vigorous. Those with a larger spacing recommendation are generally going to be larger and more vigorous plants. Now that you've determined how many plants to use in your container it is time to start placing them in the planter. It is always best to leave some space between the top of the soil and the edge of the pot. In small containers half an inch is good, but for larger containers you should leave an inch or maybe even two. This is called headspace and it helps to keep soil from washing out of the container and it helps channel water into the container. Without headspace water would simply run off of the container. Adequate headspace makes watering much easier. Once you've added potting soil, it is time to start arranging the plants within the planter. It is best to leave an inch or two between the edge of the pot and the edge of the soil from the plants. This will give the plant room to root-out in all directions. From there you simply want to arrange the plants so each plant has some room and the whole planter will be filled. If you are using 4 plants in a semi-circular planter, you would likely put 3 along the back with one in the middle front (below, left). For 4 plants in a round or square planter, you are most likely to either put them in a square formation or to put them in an equilateral triangle and then place one plant in the center (middle photos below). For a rectangular planter, 4 plants would work best with two along the front and two along the back in a checkerboard pattern (below, right). For 5 plants in a semi-circular planter, you will most likely put one plant in the front, two plants in the middle on either side of the first plant, and the last two plants at the back of the planter close to each side (below, left). For 5 plants in a circular or square planter, you are likely to put 4 of the plants in a square with the 5th plant in the middle (below, center). With a rectangular planter, 5 plants would be a checkerboard with 3 plants along the front and 2 along the back of the planter (photo, right). Once you get above 5 plants in a round or square container, you will probably want to plant at least 3 towards the outside, more or less equally spaced out. Place one in the center and then place the rest between the outer plants and the center plant. In rectangular planters the checkerboard pattern we use for 5 plants is a pretty good way to go. For a semi-circular shape, I would place one to two plants at the front and then fill in behind that with the rest. If you are planting a mono-crop (all one plant), you can simply put one plant in each spot. If you are planting a combination planter (several different plants), you need to pay attention to color, texture, habit and height. As you are planting, try and spread the plants somewhat evenly throughout the planting area of the container while leaving some space between the edge of the container and the root ball of the plants. If you do that, your planters will look great. I've just saved this and the other 3 pieces in this series to my Pinterest board. They are very well written and informative and give good, basic information which is what every one needs to keep handy. Thanks! First let me thank you for this great series of articles on container garden design. As a novice gardener they have been extremely helpful. I have found your designs outstanding and attempt to create them whenever possible. On occasion though I've found that I'd like to do the arrangements in different colors and perhaps substituting a plant variety. My problem is that when I do want to substitute anything different I'm not sure of how to read your planting recipes. I've noticed that you will repeat the same alpha character in your designs, but change the size of the character as well as its background color and shape. For example your recipe for Breathtaking utilizes two (2) letters "A". The first A is bold and has a yellow background and the second A is a bit larger with a pink background. Please explain what the different sizes and backgrounds mean in your recipes. Thank you in advance for your reply to this question. Thanks for the opportunity to explain how to decode our recipes. Our recipes use the Thriller/Filler/Spiller idea for creating combination planters. The idea is that when planting a container you need somthing that spills over the edge of the pot (the spiller), something that adds height to the planter (the thriller) and something that filled in the middle ground of the planter (the Filler). This article has a more in-depth explanation of this planting method: https://www.provenwinners.com/Container-Design. Since this is a common way to plan container plantings, we categorize our plants as one of those three options - thriller/filler/spiller. Our Recipes then ID which of these classifications each plant in the recipe are. Thrillers - have a yellow to orange color and the symbol kind of looks like a flame. Fillers - have a round green symbol that kind of looks like a gear. If you look closely at the key for the planting diagram, under each sumbol for that combo it will say thriller, filler or spiller. Now some times there will be more than one filler, spiller or thriller. In this case, the first Spiller would have A in a pinkish purple sun symbol. The second Spiller would have a B symbol in slightly different shade of pinkish purple. The third spiller woulc have a C in yet another slightly different color of pinkish purple. This is true for the other two categories as well. The shape of the layout for the container is the approximate shape of the top opening of the container used for the combination in the photo. I think that covered the questions you had. If I can be of furhter help, let me know. Thank you for posting this. Very helpful, especially in considering different sizes and shapes of containers. Mine wouldn't have made it! Yesterday I planted 18 plants in a no larger than 15 inch container. I think this afternoon I will re-do it! I had been wondering about it all night and morning. I am glad for your information. Start over! In fact I think all my baskets and plants were overdone! Thank you for making this article. I'm a novice, and this was exactly what I was looking for! Very Helpful. This article was very informative. I'm a visual person, so the sketches were great! Very helpful. Finally an actual diagram for container planting! Thank you so much!